The beaches of Kalami and Kefala on the island of Alonissos in Greece, information and pictures. Kalami Beach and Kefala Beach are two beaches in the northwest of the island of Alonissos. 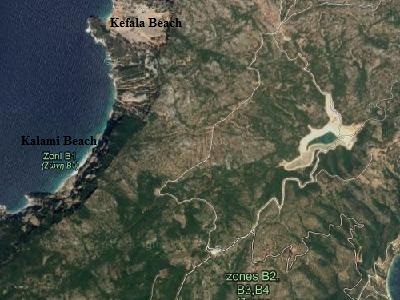 One beach is quite large (Kalami) and the other beach is small (Kefala). Both beaches are remote and have no facilities (no sunbeds, umbrellas, taverns or accommodations). You can reach these beaches by boat. As far as I could find out there are no roads or paths leading to either of them. Both Kefala and Kalami beach are pebble beaches. Unfortunately I have no further information on these beaches.